ARCH - 1, TA - 2, LOOP - 3 and WHORL - 4. Why not ARCH - 1, LOOP - 2 and TA - 3 WHORL - 4? In 5-E system, the graduation of materiality is considered from earth to water to fire to air, which goes with ARCH, LOOP, TA and WHORL. Regarding Richard's system... it is important be aware that in his system the 'tented arch' also includes central positioned loops; regarding this aspect Richard's approach differs from probably ALL other fingerprint systems in the world. But from a fundamental point of the Elementary system also presents a weird (questionable) approach... because from the dermatoglyphic point of view a 'tented arch' there can be no doubt that a 'tented arch' is more similar to an arch (than a loop); and in this perspective the Elemental system probably differs from ALL other fingerprints systems in the world. By the way, I don't recognize much 'quality' in the activity of labeling the fingerprint types with a point-system (which can become misleading)... because in the perspective of volar pad development the development of each individual pattern is a result of 'timing' & 'size' - which implicates that whorls can result from a DELAYED development... just like arches can be the result of a LACK of development. Kiran, I hope this makes sense for you as well. Agree with Martijn that Richard's system and 5-element system each have their own unique approach. But Kiran you can think of the 'tent pole' in TA print as adding fire. Thank you Martijn and Lynn. My main qtn was: Why is TA ranked higher than LOOP in Unger's system. While in 5-E system TA comes after LOOP, considering that TA is FIRE and LOOP is WATER and elemental graduation of materiality. But, Martijn's picture on finger prints ordering by Cummins and Midlo helped me to understanding the ordering. B.t.w. is this ordering by Cummins and Midlo from 1 to 39 based on the reversal of the time required for development of these finger prints? Kiran, as you know, Richard's system and 5-element system are just different ways of looking at hands. His ranking system is not based on graduated materiality, so you can't really compare the two. Personally, I find Richard's system confusing regarding TA. He classes true tented arches AND loops with a central triradius, both as tented arch. so I guess that's why he puts them between arches & loops. Loops with a central triradius would be classed as loops (water) in 5-element system. Whereas the 'tent pole' upthrust in the TA is seen as fire. lower-than-average ridge counts (Meier et al., 1987). in determining TFRC (Holt,[/left] 1968)." Lynn - That's why I wanted to understand on what basis Richard was ranking these. But, got what you're saying. Martijn - Couldn't understand the much of biological stuff there . But you made it simple - "one can not say that whorls develop faster or slower than arches". Then is it that - archs are easy to form, while whorls are difficult?. That's what I could see from the Cummin's and Midlo diagram. The issue I am facing is - we have many things in the palm, which I think have to be prioritized. Finger prints, handshapes and skin structure form the basic structure of hand upon which the rest of the story gets woven. However, fingerprint should be given highest priority as they are totally fixed. Within the fingerprints, Richard has formed a system-by comparing the rankings of these and getting into different dimensions of life. Trying to get a basic grounds of this system. Kiran, you know that 5-element order earth,water,fire,air is based on graduated materiality of the elements from most tangible & concrete to most intangible, discrete. Richard seems to have based his ranking on triradius - none (arch), one central (TA), one off-centre (L), 2 (whorl). 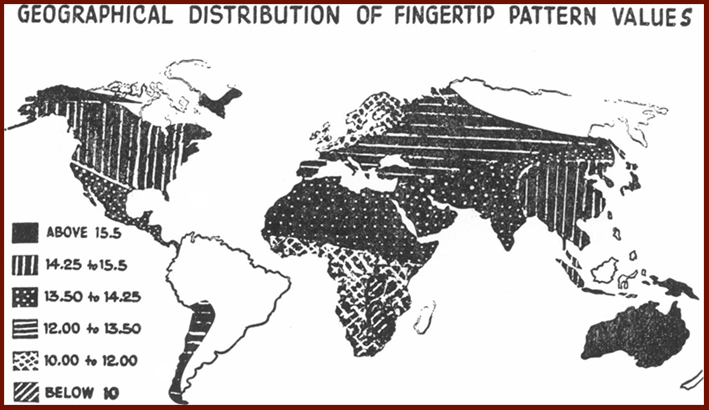 In his introduction he says that his inspiration for this system came from looking at the diagrams in Cummins & Midlo "Fingerprints, Palms & Soles", as though remembering a long-forgotten ancient wisdom, and he received the whole picture in his brain. I guess like a Eureka moment. "Ranking" doesn't mean that any print is worse or better than any other. These are just ways of putting them in some sort of order. Richard says "There are many ways to think about fingerprints, but it doesn't matter how or why fingerprints operate as a map to our core psychology. The fact is they do." As you say Kiran, the fingerprints are very important because they represent a fundamental, fixed aspect to our personalities that was formed when we were foetus of about 4 months, and they never change. Regarding the biology, this page explains some of it - scroll down to fig 1.4b and read below it. Lynn wrote: Regarding the biology, this page explains some of it - scroll down to fig 1.4b and read below it. I very much like the first source - where figure 1.4b demonstrates how a loop tends to develop. So far I found it difficult to visualize (and remember) how the triradius is formed, but the featuring description for figure 1.4b + the red triangle and the green dot explain the details very well (and especially the part which describes that the volar pad does not really 'shrink' in size... but instead sort of disappears as the surrounding areas grows larger, is kind of new for me). The picture also kind of shows that ALL FINGERPRINTS probably start developing like a 'whorl', but during the process the variations (this is where 'timing' and 'shape' become involved) will decide whether it continues to manifest as a whorl... or instead become a loop or arch. 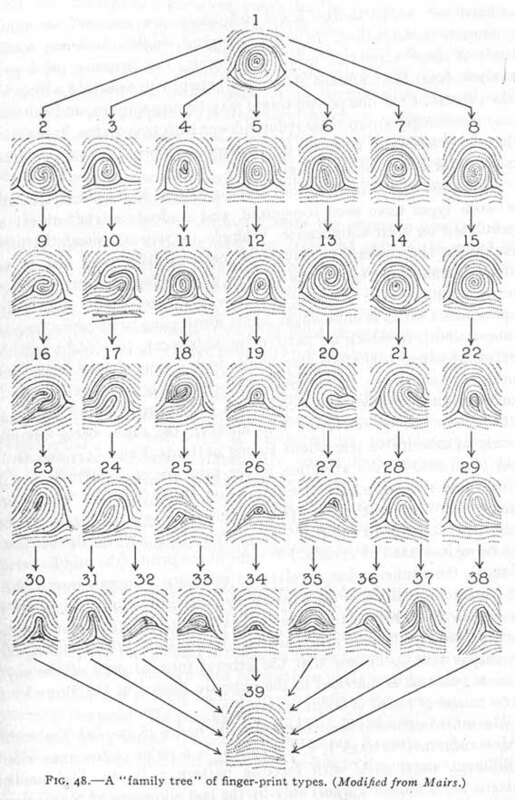 I think this explains why Cummins & Midlo describe the whorl as the first 'archetype' of a fingerprint - because it this shows the features that remind us of the (swelling) volar pad. Kiran, I think Lynn's first source indicates that... whorls form more easily than arches; this is also illustrated by the fact that whorls are much more common than arches; in primates they are even more common than in humans. Does this now make sense for you as well? I also found it interesting to read in that article, that when they talk about the pads "regressing", "The pad does not actually shrink in size, but the surrounding area growth begins to catch up and the prominence of the volar pad decreases." I was going to ask - so if it doesn't shrink, why does he still use the term 'regress'? But now I get it, when he still talks about it regressing (returning to a previous state), it returns to its earlier proportion to the rest of the finger, because the finger grows. Thanks for pointing this out Lynn, nice to see that this passage caught your attention as well (see my earlier comment). Martijn, yes things are falling inline for me now. Lynn - nice material. Thank you. Unfortunately, I have left Richard's Lifeprints in India!! . What I am looking for is if there is any study which compares the presence of 1 set of finger prints against the other and one set of finger prints pulls up, while the other pulls down. whorl and the related air element marking in hands will be enhancing the knowledge aspect of the person. while loop and water related element markings in hands will be giving a loving and connecting tendencies in the person. Now, these 2 might go with each other/contradict with each other(in which case, one will be life purpose and another is life lesson). In either case, both has to be balanced. I am just trying to co-relate the finger prints with the hand formations and want to listen to your opinions here on how do you merge the readings giving a high importance to finger prints and mixing them appropriately and relatively with hand markings. You talk about '1 set of fingerprints', and you talk about your ten fingerprints... I assume that you consider your specific combination of 10 fingerprints as '1 set of fingerprints'. Correct? Though some 'sets of fingerprints' are relatively common (10 loops are seen in almost 10% of people in counties like the US & UK), all other combinations (there are literally hundreds of possible combinations) are far less common.. and most combinations are even quite rare. For your combination (9 loops + 1 whorl) we can discriminatie even 10 different variants: as we can imagine that the whorl is found on 10 different fingers. Due to this huge variation it is hardly possible to study how '1 set of fingerprints' interacts with the rest of the hand (especially since there are dozens/hundreds of factors that can be considered). So, I don't think that there are any of such scientific studies available. And in the palm reading literature we don't find such studies neither. But maybe I have misunderstood your question? No Martijn, you were right. You didn't misunderstand what I was asking. However, the 9/1 combination was not of my hands. I have all 10 loops, I was just quoting an example. You're saying there is no system in the world which compares 1 set of FP with another set.